You can also download the entire Antony and Cleopatra translation as a PDF! CAESAR marches with his foot soldiers in one direction across the stage while TAURUS, CAESAR'S lieutenant, marches the other way. After they leave the stage, the sound of a sea battle is heard. An alarm is sounded. ENOBARBUS enters. Naught, naught, all naught! I can behold no longer. Th’ Antoniad , the Egyptian admiral, With all their sixty, fly and turn the rudder. To see ’t mine eyes are blasted. Lost, lost, all is lost! I can't watch it any longer. The Antoniad, the Egyptian flagship, along with the sixty other ships, have turned around and fled the battle. It destroys my eyes to see it. Gods and goddesses,All the whole synod of them! By the whole assembly of the gods and goddesses! The greater cantle of the world is lostWith very ignorance. We have kissed awayKingdoms and provinces. The largest portion of the world is lost due to extreme ignorance. We have lost our kingdoms and provinces. On our side like the tokened pestilence, Where death is sure. Yon ribaudred nag of Egypt— Whom leprosy o’ertake!—i’ th’ midst o’ th’ fight, When vantage like a pair of twins appeared Both as the same, or rather ours the elder, The breeze upon her, like a cow in June, Hoists sails and flies. On our side, it's as if we've been struck with the plague, which means that death is sure to come. That lustful old Egyptian horse—may leprosy strike her down!—in the very midst of the fight, when the advantage appeared to be even, or rather greater on our side, acted like a cow in June driven by a slight wind, and hoisted sail and fled the battle. That I beheld.Mine eyes did sicken at the sight and could notEndure a further view. I saw that. It made me sick to watch it happen, and I couldn't bear to watch it any longer. She once being loofed, The noble ruin of her magic, Antony, Claps on his sea-wing and, like a doting mallard Leaving the fight in height, flies after her. I never saw an action of such shame. Experience, manhood, honor, ne’er before Did violate so itself. Once she had prepared her ships to leave, Antony—that noble man who has been destroyed by her magic—hoisted his sails as well and, like an overfond duck, left the battle at its very height and flew after her. I had never seen such shameful behavior. Never before has any man betrayed his better knowledge, his manhood, and his honor so severely. Our fortune on the sea is out of breath And sinks most lamentably. Had our general Been what he knew himself, it had gone well. Oh, he has given example for our flight Most grossly by his own! We have lost our advantage at sea, and our prospects for success are decreasing depressingly quickly. If our general had been true to himself, the battle would have gone well for us. Oh, he has set an example for us to abandon him, as he so disgustingly abandoned us! Ay, are you thereabouts? Why then, good night indeed. Ah, are you thinking that too? Well, then, it really is over now. ’Tis easy to ’t, and there I will attendWhat further comes. It's easy to get there, and I'll wait there to see what comes next. To Caesar will I renderMy legions and my horse. Six kings alreadyShow me the way of yielding. I will offer my legions and my horses to Caesar's service. Six kings have already set an example by similarly yielding to Caesar. I’ll yet followThe wounded chance of Antony, though my reasonSits in the wind against me. I'll stick with Antony and his diminished chances for now, even though I'm acting against my better judgment. Devlin, Maria. "Antony and Cleopatra Translation." LitCharts. LitCharts LLC, 11 May 2014. Web. 19 Apr 2019. Devlin, Maria. "Antony and Cleopatra Translation." LitCharts LLC, May 11, 2014. Retrieved April 19, 2019. https://www.litcharts.com/shakescleare/shakespeare-translations/antony-and-cleopatra. 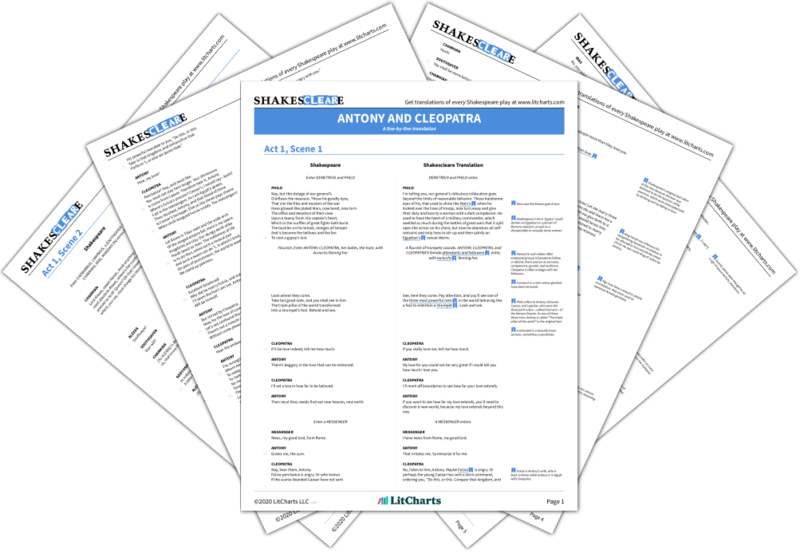 Join LitCharts A+ and get the entire Antony and Cleopatra Translation as a printable PDF. Maria Devlin received her Ph.D. in English Literature from Harvard University, where she specialized in Renaissance drama. She has worked as a bibliographical and editorial assistant for The Norton Anthology of English Literature and for The Norton Shakespeare. 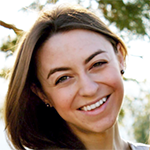 She is currently working with Stephen Greenblatt to design online courses on Shakespeare, including the modules "Hamlet's Ghost" and "Shylock's Bond" offered through HarvardX. She is writing a book on Renaissance comedy. William Shakespeare. The New Oxford Shakespeare: Modern Critical Edition. Eds. Gary Taylor et al. Oxford: Oxford University Press, 2016. William Shakespeare. The Norton Shakespeare, 3rd ed. Eds. Stephen Greenblatt et al. New York: W.W. Norton& Company, Inc., 2016.